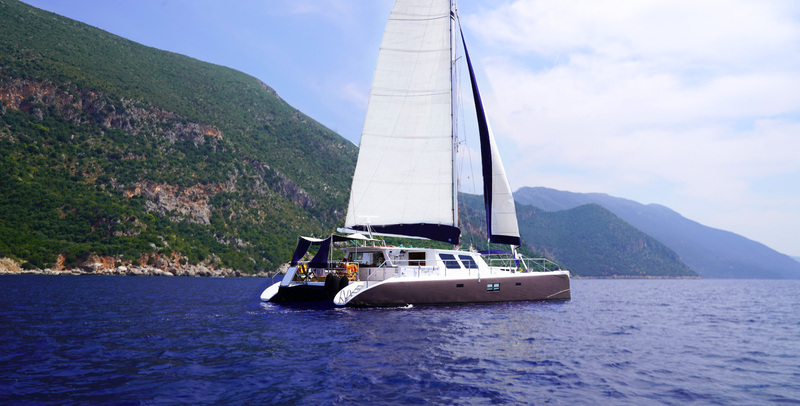 Mystique is a top-notch crewed 69 ft sailing catamaran, available for charter in the Ionian Sea. We will be typically starting our charters from the beautiful island of Corfu during 2019 and 2020. Mystique is sheer luxury on the water and is a cut above the rest. 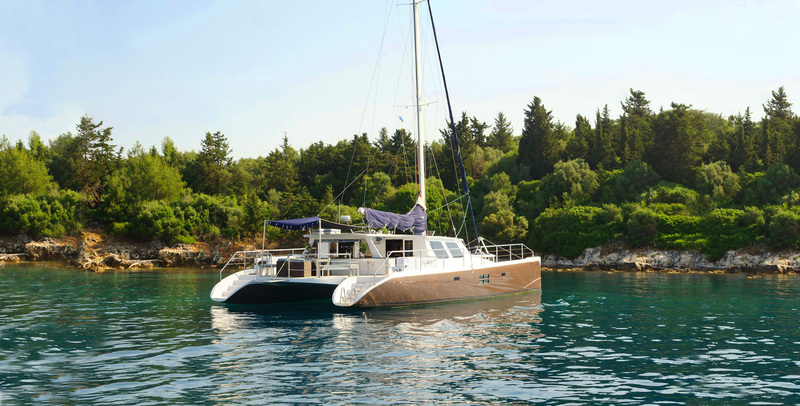 She is one of the most beautiful and biggest catamarans available in the Eastern Mediterranean. The high quality bedding, linen, crockery, cutlery and glassware is normally to be found in the top tier hotels rather than at sea. The superb standards, high class cuisine and attention to detail such as the 'all day' snack and fruit baskets will make your charter holiday by far the best you have ever experienced. Spend your days doing as little or as much as you want. Take in the beautiful scenery, laze on deck on one of the sun-beds and read a book from our extensive library. Take time to go swimming or snorkeling in the crystal clear waters of the Greek Islands. Your accommodation, luxuriously appointed air-conditioned staterooms with ensuite heads are the faire. You will enjoy the spacious teak aft deck, like you have not seen a deck on a yacht less than 40 m before. Your private charter on Mystique will be like your personal floating resort. Our world-class crew with exclusive service are your personal staff on board Mystique to accommodate your every need. You will enjoy stunningly beautiful new destinations every day. 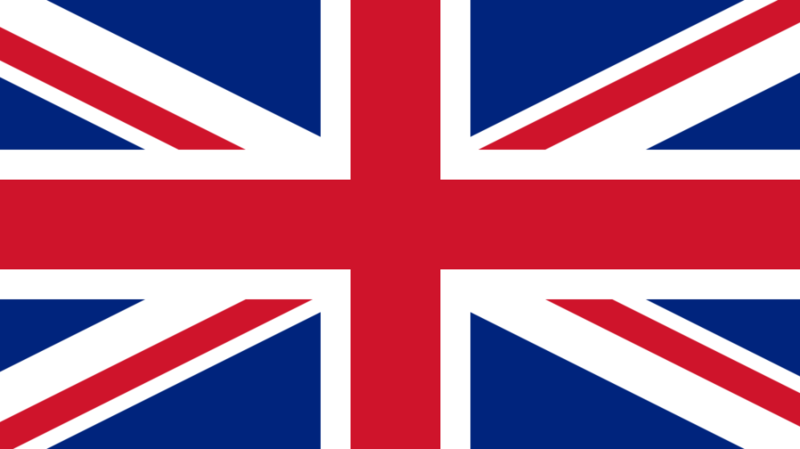 The planned itinerary is flexible and can be tailored to your preferences if possible. Whether you want to explore an island, remote white beaches, snorkel in turquoise crystal clear water or explore the rich historical culture and seaside towns of Greece ... you have the freedom to enjoy many alternatives on this magnificent voyage ... We will make your dreams and imaginations come true.. Relax in luxury and leave your stress behind as you overlook the beauty of the Greek islands. Enjoy waterskiing as the rest of your party snorkels. The beauty of a private yacht charter is that everyone can enjoy activities of their choosing, making it a wonderful family vacation or a stunning experience with friends. You will board Mystique at 12.00 on your charter day in the Marina Gouvia near Corfu Town and be welcomed with a cocktail and hors d’oeuvres. 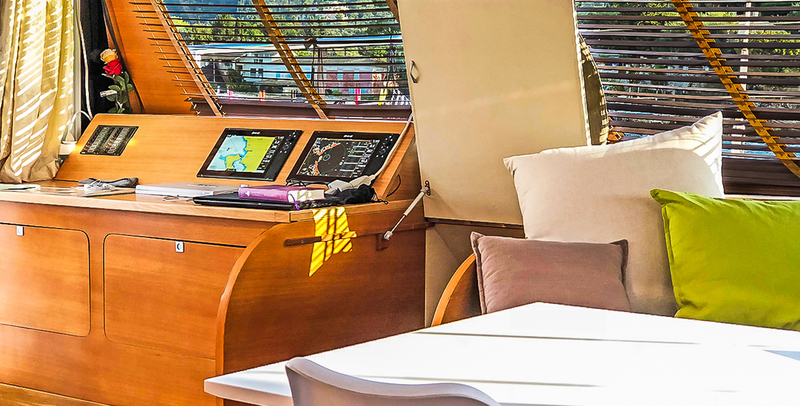 Once your skipper has completed the customs formalities, you will be shown your cabins before setting sails for a beautiful bay in the vicinity where you will enjoy your first meal on board Mystique and perhaps even have your first swim! The sunset at anchorage will be unforgettable. During this week we will be cruising the Ionian Islands around Corfu, which is a very sheltered and safe cruising ground. Anchoring in secluded bays, visiting the islands of Paxos, Anti-Paxos and many stunningly beautiful places. After a fantastic week of relaxation and new experiences, we will return to the Marina Gouvia. As we are back in the marina, the Friday night evening meal will be taken in a 100 year old family taverna close to the marina and a ten minute walk from the boat. This will be at your own expense. The following morning you will have your final breakfast and snacks onboard prior to departure at 12.00 hrs. At the end of 2019 (dates and details to be confirmed) Mystique will be embarking on a crossing to the Caribbean / Panama. If you have ever wondered what it is like to crew on an ocean going yacht you can satisfy your curiosity and book for one or more of the limited spaces available. Please remember that the cabins are double cabins and if you are single you will likely have to share a cabin.